You’ve gone an invested some money in a self storage space. You’ve decluttered your home, made space in your office, and are feeling good about the money well-spent, but now you have to think about what you are going to do to keep the storage unit clean. Just like any other property you own or lease, it is your responsibility to keep it as neat and organized as you would like it to be. A self storage unit does require some upkeep, but the below cleaning tips will help you ensure that your storage space is always tidy and well looked after. Many people invest money in a self storage unit because they think it will help them declutter their lives, only to find that their self storage unit has become another cluttered space to worry about. It is a good idea, once every year, or even every six months, to open that storage door, take a step back and think about what you really need to hold onto and what can be donated or sold. Most self storage facilities recommend that you come in, at least annually, and rotate the contents. By getting in and rotating the contents around (while making sure that you are keeping with best organizational practices), you give yourself the opportunity to inspect every square inch of the unit, remove dust, check to see what has accumulated under boxes and garment storage racks, and tackle grime as it accumulates. If you don’t have a shop vacuum, your self storage unit should prompt you to invest in one. Shop vacuums are durable and adept at vacuuming up most anything. Best of all, you can keep your shop vacuum in your self storage unit. Keep it near the front and every time you come in and out to retrieve something, give the place a quick once over with the shop vacuum to make sure that you aren’t accumulating dust. Most self storage units will inform you of a wide range of things that you can’t or shouldn’t keep in self storage because they will attract pests. But some things (especially certain fabrics and textiles) can end up attracting insects anyways. Sometimes pest problems are not even your fault. An irresponsible neighbour might have left something in their unit that has attracted an infestation and your unit simply becomes collateral damage. 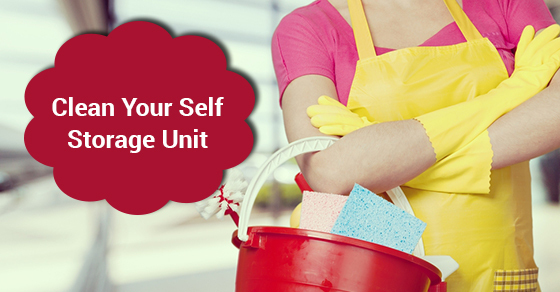 Keeping your self storage unit clean is not nearly as complicated as keeping your home clean. It requires much less tender loving care than your bathroom or your kitchen, so it is not something that you have to dread doing. Keep the above simple cleaning tips in mind and you will never have to worry about walking into a filthy storage unit.